Delorean have stuck together. They started the band as teenagers in the Basque Country town of Zarautz in Spain, informed by a love of hi-hat-frenzied dance music, then moved to Barcelona, where they fully embraced carefree Mediterranean club music on their celebrated 2010 LP, Subiza. After touring heavily in support of Subiza the band built their own studio in their adopted hometown of Barcelona – looking for a semblance of normalcy to record their follow-up, Apar. However, a failed relationship, a national financial crisis and an embrace of a more sophisticated relationship to sound recording and songwriting push the stories and dynamics of this album to a deeper more complex place. Lead singer, lyricist and bassist Ekhi Lopeteg calls Apar simply their “big production album”, but through his articulate lens, the record’s emotional undercurrent, and the band’s mastery of luxurious, coast-of-Spain beats, Apar is something altogether more illuminating. Delorean toured for nearly three years after releasing Subiza, so when the band – Lopetegi, Guillermo Astrain (guitar), Unai Lazcano (keyboards) and Igor Escudeo (drums) – settled back home in Barcelona it should be no surprise they set out to make their lives as normal as possible. For some much needed structure and control, they built a private studio in El Poblenou, an industrial neighbourhood that borders the Mediterranean Sea. “It was a really normal life”, Lopetegi says of their time writing and recording Apar. “We needed that after three years of touring. The studio really looks like a working place, and it feels like it too. Even our working times were more normal: we’d wake up, go to work, have a lunch break, keep working and meet up with friends after”. Outside of the serenity of the studio however, life was not so normal. A breakup serves as a foundation for reflection on the madness of unconditional commitment. “There are a lot of ‘you’s’ in the lyrics” explains Lopetegi, “but I didn’t try to write a plain narrative of what happened”. The lyrics explore the contradiction between being a finite person and feeling compelled to pledge infinite, unconditional love – or friendship, or persistence, or even allegiance to the other. 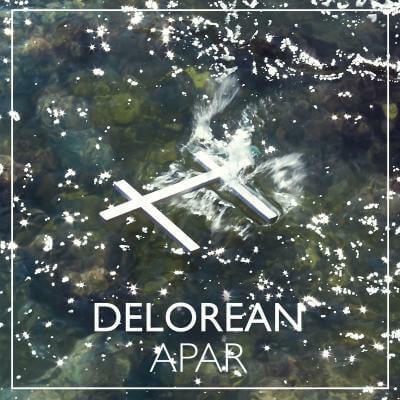 The global financial crisis has hammered Delorean’s home of Spain, leaving nearly a quarter of the population unemployed while Apar was being recorded. In this light, the album’s story of the impermanence of love undergoes a subtle torque, so the record can also be seen to examine the changing nature of not just love, but hope. Like abiding lovers, people persevere and stand firm while something they thought was strong and true erodes around them. Perhaps betraying Lopetegi’s schooling in philosophy, his songwriting begins with a specific, deeply personal event – a breakup – then expands to reach out to anyone. For Apar the band set on a musical journey to get to the core of their songwriting. Leaving behind the ornate and layered production of Subiza, the chopped up female vocal samples have been replaced by actual singers and the bare minimum of instrumentation is all that remains to support them. This measured approach that the band embraced for Apar is what waning relationships sometimes need in order to survive. The album’s poignant cover art unites the universal breakup story of Apar – the title, a Basque term referring to froth or foam – and the album’s refined analog production. Inspired by graveyard crosses built by the Basque artist Jorge Oteiza, it depicts two wooden crosses, connected together as if grasping arms in an unconditional embrace, that have been thrown into the sea of Cap the Creus, a Northern Spanish region known for its hard wind and dangerous crags. Yet the crosses – though their very form symbolises death – hold on to each other. “Death shall have no dominion” as Lopetegi sings on ‘Dominion’, quoting the poet Dylan Thomas. They’re afloat for now, connected now, real, ever on the move. Amid turbulence, Delorean have bonded tight too, and with Apar the band has made the most powerful, dynamic, and moving album of their career.